I’ve been watching Masterchef Australia and been constantly amazed by the artistry of plating, the innovative use of ingredients and the inspiration from childhood food memories that the contestants seem to excel at. I would never be able to survive a single pressure test or to be able plate the way these guys do. But I do understand the need to call forth one’s food memories and be true to the flavour profiles that characterize our taste vocabulary. I believe there is such a thing as taste vocabulary. I liken it to a kind of language of the palate. It is well known that people who grow up speaking tonal languages have the ability to perceive subtle tonal differences in other tonal languages whereas those who do not tend to have difficulty perceiving differences in tones. So I have friends from Northern European countries who have visited me in Singapore who don’t really understand the local vibrant flavours. Perhaps it is a kind of sensory overload? I suspect that as Singapore is such a melting pot of food cultures that Singaporeans have probably got some of the most diverse exposure to different foods. And so this nation is full of amateur foodies, all of whom have strong feelings about the best food options around. So when it came to making beef rendang I realize that people are also going to be strongly passionate about their favorite kind of Rendang. Rendang is a kind of dry curry that is typical of Malaysian or Indonesian food. It is usually cooked on special occasions – it often figures at Hari Raya celebration and even at Chinese New Year gatherings, which is a testament to cross ethnic pollination of food delights in Singapore. It has even been cited as the most popular food (World’s best 50 foods) in the world based on a public straw poll. Rendang usually contains 4 key essentials: the meat, coconut milk/cream, the spice paste and the chilli. This particular Rendang, like most Malaysian rendangs, uses toasted grated coconut called kerisik. This thickens up the curry and gives a lovely caramelized oily flavour. The use of kaffir lime leaves also reminds me of childhood holidays in Penang when my grand aunt would spin out effortlessly beautiful local dishes. There is a particular fragrance that the kaffir lime leaves lend to the curry. Rendang usually takes several hours on the stove. It is a dish that needs to be made with love. The coconut kerisik for example needs careful toasting until it browns evenly – under or over toasting would be a disaster. The Instant Pot takes away the bulk of cooking time and even tougher cuts of meat become melt-in-your-mouth juicy pieces. I already know restaurant chains that use pressure cookers to make signature Chinese braised beef stews; I’m just surprised that I’ve seen very few people pressure-cooking Rendang. Making Rendang in Singapore is super easy as there are many spice pastes available. But making the spice paste from scratch is amazingly tasty and it’s well worth the effort. Cut the dried and soaked chilli into smaller pieces, as well as the turmeric, young ginger and galangal. Blend these together in a food processor. Add the shallots, ground cumin and ground coriander and a tbsp of oil and blend further. The oil helps to bring the spice blend into a paste. Blend into as fine a rempah paste as possible, pulsing frequently. Set aside. In a non-stick pan over low to medium heat, dry fry the grated coconut until it is brown but not burnt, stirring frequently. This takes about 15-20 minutes. Transfer to a spice grinder and grind fine. This will give an oily sticky mixture known as kerisik. Set aside. Add 2 tbsp oil into the Instant Pot and put on sauté mode. Add the rempah, lemongrass, cinnamon stick, cloves, star anise, cardamom pods, and half the kerisik. Sauté for about 5-8 minutes, browning the rempah further. Add the beef pieces, salt and coconut cream, tamarind paste and 1 cup of water and stir through. The liquid should just cover the beef pieces. Turn off the sauté mode and seal the pot, putting the valve in the sealed position. Put in manual high pressure for 45 minutes. When done, do a quick pressure release. Stir in the rest of the kerisik, coconut sugar and kaffir lime leaves and adjust the salt as necessary. Remove the beef from the pot and put into a casserole dish. Put the pot on sauté mode and reduce the liquid, stirring for about 10 minutes and being careful not to burn the bottom of the pot. When done, ladle the sauce over the beef pieces. For the cauliflower rice, process the cauliflower into small pellets in the food processor. Add 1 tbsp oil into a non-stick pan. Add the mustard seeds. When the seeds start to pop, add the shallots and garlic and stir fry for 1 minute. Add the cauliflower pellets, turmeric powder, onion powder and salt. Continue to sauté for another 5-6 minutes till the cauliflower pellets have softened. 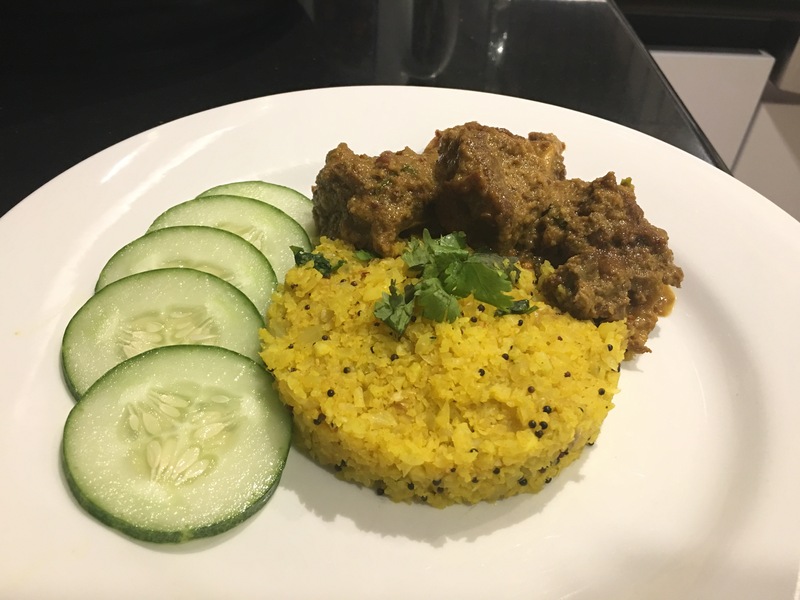 Serve the yellow cauliflower rice topped with the beef rendang and with cauliflower slices on the side.